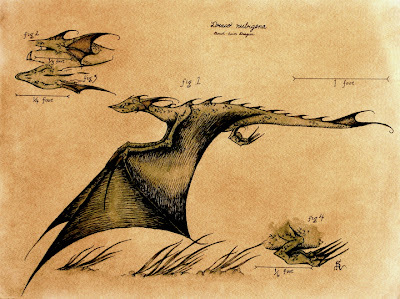 I am a 28-year-old naturalist and illustrator of mythological, fantastical, whimsical and cryptozoological organisms. During my day-to-day life I am a doctoral candidate studying the evolution and ecology the little wingless dragons of the Chihuahuan Desert. In Twelfth grade, when I was but 17 years old, I had the opportunity to illustrate some 12 common and rare creatures. These visual documentations are from my travels as a naturalist and historian of cryptozoology. 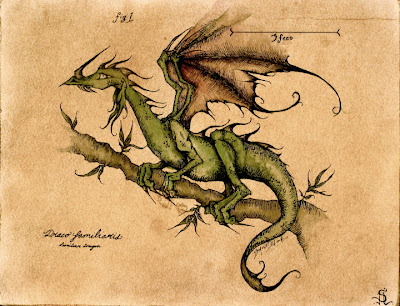 With a wild population estimated at 500, Draco familiaris, the Familiar Dragon is a 'common' but reclusive reptile. D. familiaris is native to temperate zones of the Northern Hemisphere, but was introduced to southern New Zealand in the late 1800s. This species is mainly arboreal, and favours deciduous trees where it nests and feeds on insects, small birds and rodents. D. familiaris is rarely seen in flight and its flimsy wings are usually in tatters from climbing through branches and scrapes with defensive avians. This dragon is a reluctant fire-breather with a relatively underdeveloped fornax organ. A larger subspecies, D. familiaris georgius, is the well known opponent of St. George. The population size of Ophthalmias ophthalmias (formerly Draco opthalmias), the Gilled Dragon, is wholly unknown. In the last hundred years, only three have been sited, two of which were caught in Japanese fishing nets. 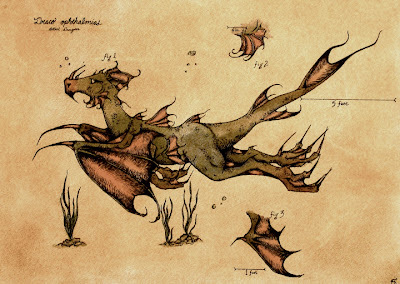 The Gilled is completely aquatic and is one of the few dragons that can breath underwater. It is a representative of the Ophthalmiformes, the clade of some dozen species of gilled reptiles. The evolutionary origin of this aquatic group is most likely independent from other aquatic reptiles such as the surface breathing Loch Ness, and extinct Ichthyosaurs. O. ophthalmias is piscivorous and its distribution is unknown. Draco nubigena, the Cloud-born, is often mistaken for flying foxes and bats; however, this speedy little drake is not exclusively nocturnal. D. nubigena preys on large insects and small birds- dragonflies, hummingbirds are known favourites. This New World reptile has an estimated population size of about 300 and prefers mild climates with nearby freshwater. Coma glacies, (formerly Draco glacies), the Ice Dragon, is a strictly arctic species that spends most of its time on sea ice. The ice dragon will swim occasionally, but usually feeds on seals while still on land. This species has unusual fur-like scales that function in insulation. 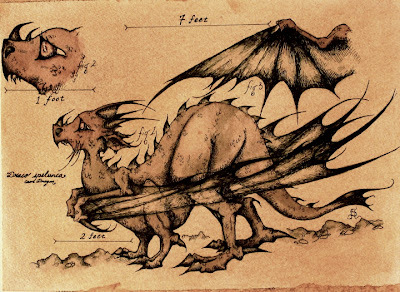 Furthermore, it displays the most advanced form of psuedo-endothermy among dragons: the fornax organ, which functions in fire breathing in most dragons, now serves as a heat generator, effectively warming the body of the organism from the inside out. The population size of D. glacies is estimated to be only 75 individuals and declining due sea ice melting. 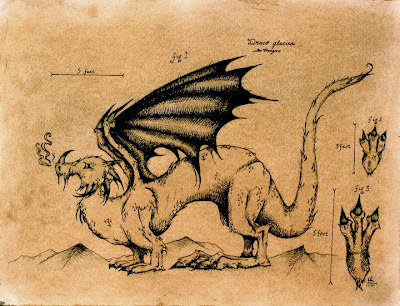 The Gargantuan Dragon, Draco ingens, is the dragon with the largest documented body size of up to 80 feet snout-vent length. This parthenogenic species is represented by only a handful of individuals - perhaps fewer than ten distributed worldwide. These rare females usually lay one egg every century; however, the last person to describe a viable egg was Madame Lucitrix Belmont in 1649. Her rash husband was quick to collect and prepare the egg for his starving family - all of whom promptly died of poisoning after consuming the yolk, rich in sulphuric acid. 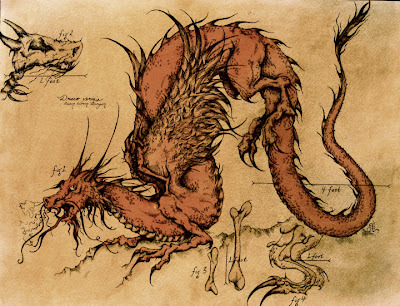 Draco ignis, the Fire Dragon, is capable of "igniting an entire village of 400 houses in twenty minutes," said one Jacobe Clements in 1736 after witnessing his town of Frentwoodshire explode in flames. The Fire Dragon excretes sulphuric acid from its cloaca before releasing flames from between its jaws, resulting in a formidable fire. 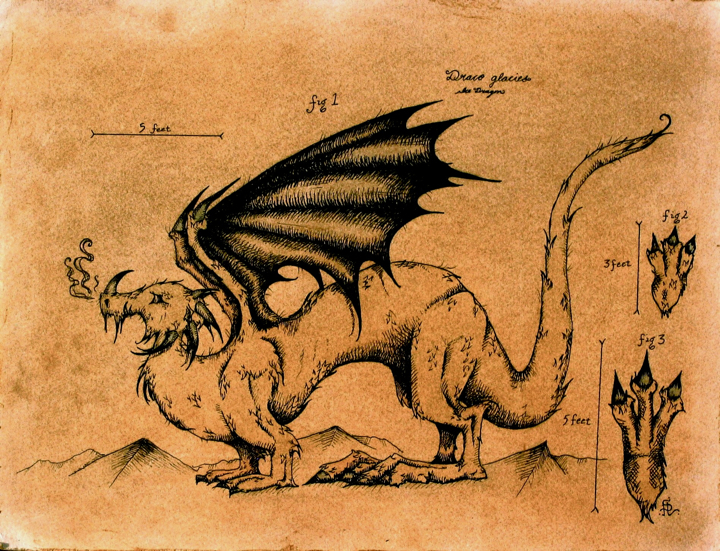 Once conspicuous in country sides of Europe and, Fire Dragons have been all but exterminated as pests. The last individuals were seen in the 1930s, although there are rumours of a reclusive mating couple in the Ukraine. 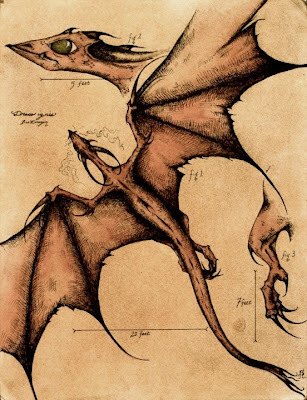 Little is known of Draco spelunca, the Cave Dragon. It lives in deep caves across the world, and has never been documented in daylight. Its eyes are enlarged for excellent vision in the dark. It probably feeds on bats and other cave dwelling animals. The population size of the Cave Dragon is unknown. Aristiphagus nicolus (formally Draco nicolus) Nicol's dragon is a small goat-like mountain dweller. A. nicolus is one of the few species from the Aristiphagidae, an exclusively herbivorous group. 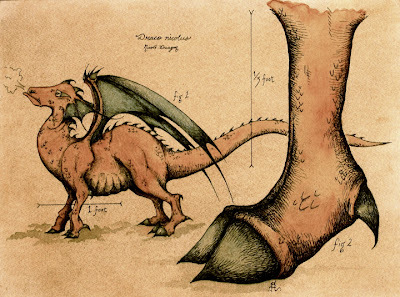 It has hoof-like toes, specialized for maneuvering across rocky landscapes. The forax of Nicol's dragon is completely vestigial, and this species cannot breath fire. The only population is a heard of about 40 individuals residing in the western Himalayas. Vermis asianus (formally Draco vermis) is the most common of the Asian Worm Dragons. 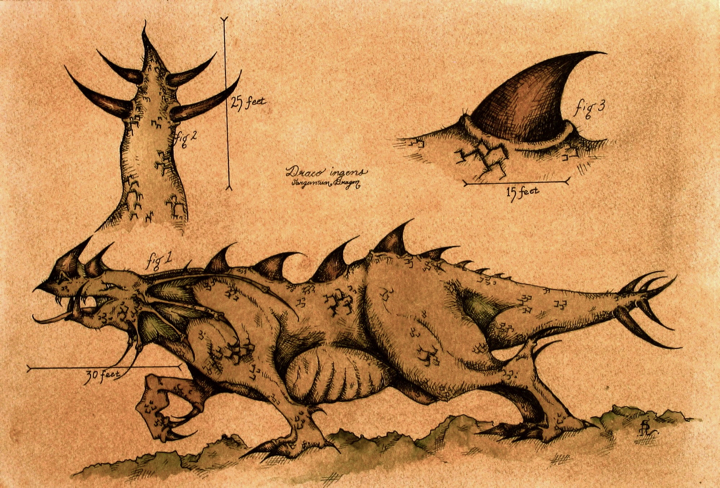 Once a specious lineage of some 50 representatives in the Orient, the Worm Dragon clade now contains only 5 genera. V. asianus is a vehement reptile, breathing fire even when unprovoked. Like other Vermids, has twice as many thoracic vertebrae as members of the Draconidae. Only some 75 Worm Dragons remain in the wild. 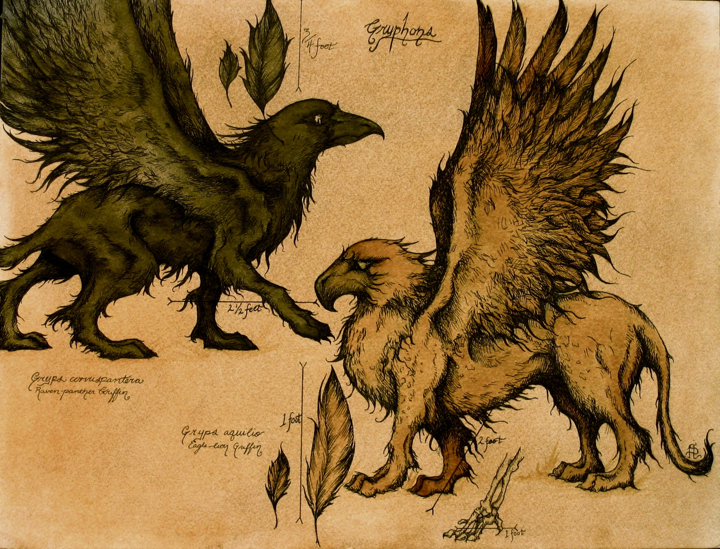 Gryphons are noble beasts, often appearing on sheilds, crests and coat of arms. The most widely acknowledged species is the traditional Eagle Lion Gryphon, Gryps aquilio. Rarer forms include the Raven Panther Gryphon, G. corvuspathera, and the Owlynx, G. strigilynx, among many others. The evolutionary origin of 'species' and the biological origin of individuals themselves is obscure. Many believe both gryphon varieties result exclusively from hybridizations between members of the Aves and Carnivora (especially Felidae). Whether gryphon individuals form mating pairs and produce fertile offspring is wholly unknown. Gryphons are flesh-eaters, their specific diets usually reflect that of their avian counterpart. Monoceros equus, the Equid Unicorn was renamed after cryptozoologists reached a consensus that horse-like unicorns (Monoceroequidae) were of an independent origin than the goat-like unicorns (Monocerocapradae), a more ancient lineage. 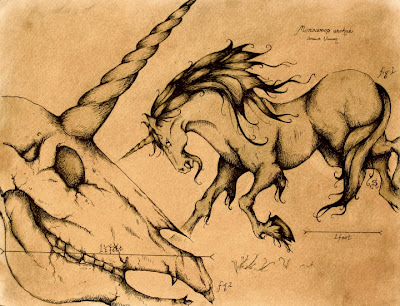 Although the Unicorn phylogeny remains controversial, only a few researchers remain interested in this dying lineage. All Unicorns are rare and ephemeral beasts. Witnesses of these poignant creatures tend not to communicate their experiences as the encounter is so fleeting and distressing that they question its reality. At one time there were some dozen or so species of Pegasus, all belonging to the genus Pegasus. The most well known species is Pegasus bellerophonus from the Greek legend, supposedly born from the severed head of Medusa. The actual biological origin of Pegasus is much disagreed upon in the literature. 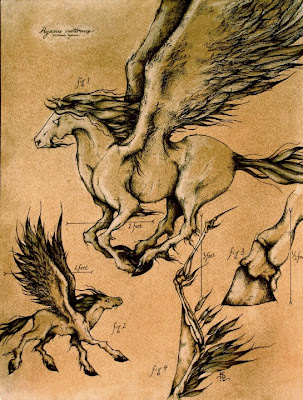 Some ascribe to the mythological legends, others believe these winged equids to be a group nested within the Cryptoequiformes, the order containing the horse-like unicorns, the Monoceroequidae. P. victorius is the most recently extinct variety of Pegasus. The last individual passed in 1830 in captivity at an age of 150 years. It is not known how many species of Pegasus exist today. All species are strict herbivores with light-weight hollow bones like those of birds. Indeed, several foolish and heavily armoured men have caused the deaths of winged-horses by crushing their fragile bones in attempt to mount and ride.